There are more than 70 active profiles in Los Angeles, CA on YADSE and counting! Los Angeles is the most populous city in the state of California and the second most populous in the United States (nearly 4 million people). The combined Los Angeles metropolitan area, also known as the Southland, is home to almost 15.4 million people. Los Angeles is a leading world center of entertainment, media, culture, fashion, and sports. It is a home base of Hollywood, also known as the Entertainment Capital of the World. There are plenty of things to do in L.A. for a first date and many romantic places to enjoy. A classic Los Angeles experience is an evening at the Hollywood Bowl where you can listen to and enjoy great live music while sitting under the stars, surrounded by the Hollywood Hills. This modern amphitheater is the largest in the country, with a seating capacity of nearly 18,000. 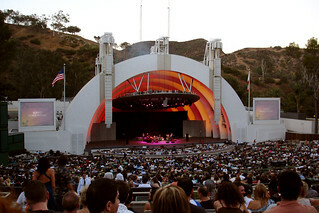 It is known for its band shell, set against the famous Hollywood Sign to the Northeast, and is used primarily for music performances. Of course, don't forget to bring your own picnic basket, full of delicious food and snacks. You can even order a takeout picnics from many top restaurants. This can be one of the best dating experience in your life to remember. Taking a walk with a date is a great way to get to know each other. If you prefer an outdoor dating, then LA is the ideal place to get outside. You can find many easy to moderate hikes. The 3 miles round-trip, Runyon Canyon Loop, provides a stunning views of the Sunset Strip, the Hollywood sign, and the LA Basin. A tougher climb, Los Liones Trail to Parker Mesa Overlook (7 miles long), will reward you with the fabulous views of the Pacific Coast. Make sure that you and your date will remember about a good hiking shoes, plenty of drinking water, wearing sunglasses and using a sunscreen. You can also try Griffith Observatory West Trail Loop or a romantic walk on the Tapia Spur Trail in Malibu Creek State Park. Everybody loves a beautiful sunsets. L.A. offers some great date spots and tasty food at the same time. We recommend the following restaurants: Yamashiro in Hollywood, considered as one of the best romantic views of the city, serves Asian inspired dishes and great service. If you are looking for a great seafood dishes, The Lobster in Santa Monica is the right choice with a beautiful view of the pier and ocean. The Restaurant at the Getty Center in Brentwood offers a delicious American food and gorgeous view. It is a perfect place for a Sunday brunch. Afterward, enjoy a stroll through the Getty Museum and the gardens. Dating in Los Angeles can be delightful! Forget about the stars on the Hollywood Walk of Fame. 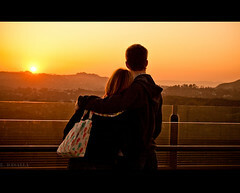 Try a truly romantic date at Griffith Observatory and watch the real stars. The Observatory is located on the southern slope of Mount Hollywood in Griffith Park, 1,134 feet above sea level. It is one of the best place to go for a beautiful view, especially at night. The person you're dating will appreciate it. Free public telescopes are available each evening the Observatory is open and sky is clear. Admission to the Observatory building and grounds is free. It is open 12:00 noon – 10:00 p.m. on weekdays (except Mondays and most Tuesdays) and 10:00 a.m. – 10:00 p.m. on weekends.